Some of the Latest Bras! 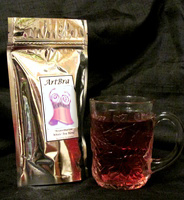 Philip Parda of Savvy Tea Gourmet, in Branford, has mixed a White Tea Blend “ArtBra Rejuvenation Tea”: a special blend to be sold under ArtBra New Haven’s logo. It’s an aromatic blend organic White Tea (high in anti-oxidants) with touches of peach, hibiscus, and rose (all organic). Just the thing to sip hot to soothe the spirit, while served iced it’s very refreshing.